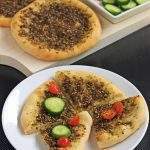 Samoon is a popular flatbread from Iraq that has a beautiful crust. Made with whole grain and topped with sesame seeds, this is a great bread to be served with soup. 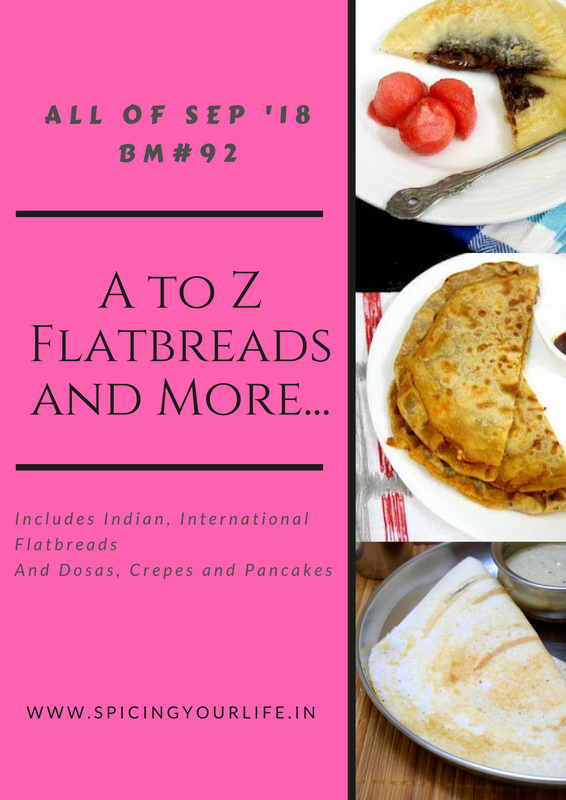 Looking for a recipe to bake with the alphabet S for my A to Z International Flatbread series, I had quite a bit of options. 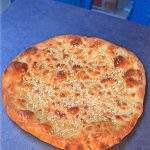 What attracted me about this particular bread, Samoon | Iraqi Flatbread, is the shape of the flatbread. I loved the diamond puffy shape of the bread and thought this will be something the boys will like to eat with some soup. I was looking to make this for dinner, but realized that we had music class at our place on that day and kids would be coming home. 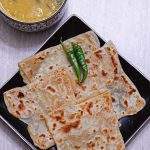 That is when I changed the plans and made the Samoon in the afternoon to serve the kids in the evening with some honey. I am so glad, that I made that decision. After the class, the kids were happy to eat the Samoon with drizzled honey and so did the parents. Wheat bran is one of my new found love. 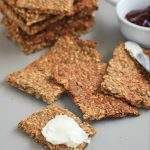 I bought some for the first time to make Aish Baladi and then used some to make the Norwegian Crisp bread. This is the third recipe in this series that I am using the wheat bran and it was just perfect. I substituted half of the wheat flour in the recipe with wheat bran. 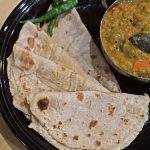 If you don’t have any bran in hand or don’t prefer it, you can skip it and use wheat flour instead. Shaping the Samoon was fun and something new that I learned. I sprinkled sesame seeds in half of the bread and made half of them plain. I have to say though that the ones with the sesame was everyone’s favorite. Even my ‘not so sesame loving’ son declared that he likes it only with the seeds. In a bowl, heat the water. I always start with little less than a cup and then add more when kneading the dough. Add the sugar and yeast to the warm water and mix well. Cover it and let the yeast rise for about 10 minutes. At the end of 10 minutes, the yeast mixture should be bubbly and frothy. 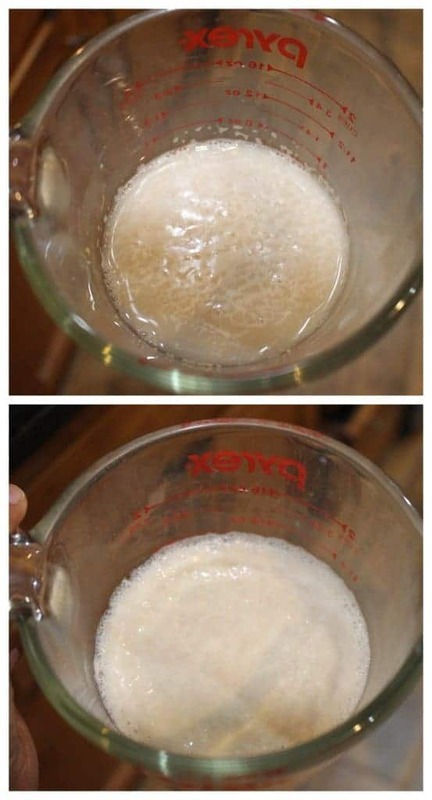 This shows that the yeast is active and working. If the yeast does not appear frothy, then start with a new batch. I use my stand mixer to knead the dough. Add the wheat flour, wheat bran and the all purpose flour to the bowl of the mixer. Add the salt and mix. Now add the yogurt, oil and the yeast mixture and start kneading the dough. If the dough appears dry, add more warm water to bring it to the right consistency. The dough should be very soft and slightly sticky. 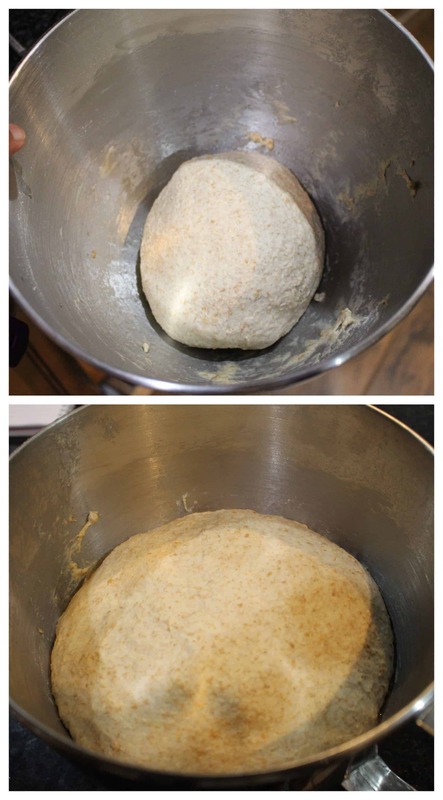 Knead the dough for about 8 to 10 minutes and then place it in a greased bowl and let it rise until doubled in volume. It took me about an hour when placed in the oven with the proof setting. Preheat the oven to 450 F. Player 2 baking trays with parchment paper. Once the dough has doubled in volume, punch it down gently and divide it into 6 equal sized balls. Roll each piece into a smooth ball and then using both your palms, roll the two edges of the dough ball to elongate the edges while keeping the center thick. Refer to the picture to help you better understand. 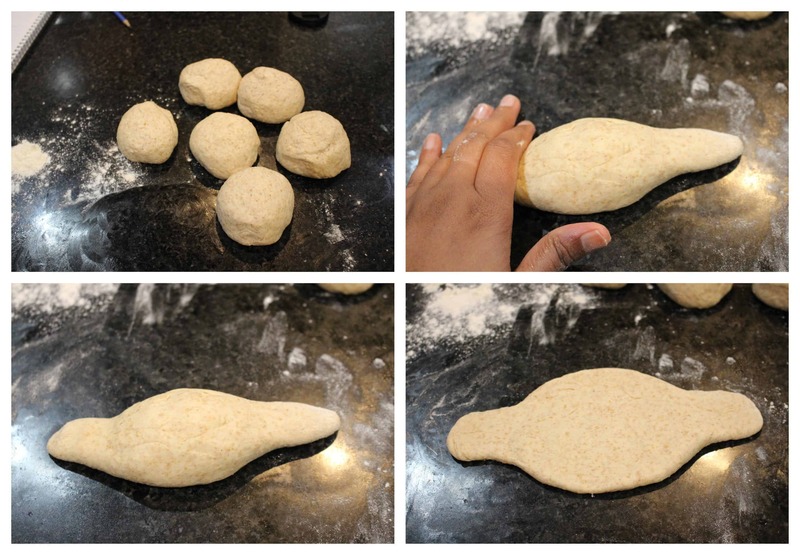 Now flatten the dough and stretch it while keeping the shape intact. Place it on the prepared baking sheet. Repeat the same with the rest of the dough. Keep the dough ball covered for about 20 minutes or until slightly puffy. Brush the top of the dough with milk and sprinkle with sesame seeds. Bake them for about 15 to 18 minutes or until the samoon is golden brown. Remove from oven and let it cool slightly on a rack. 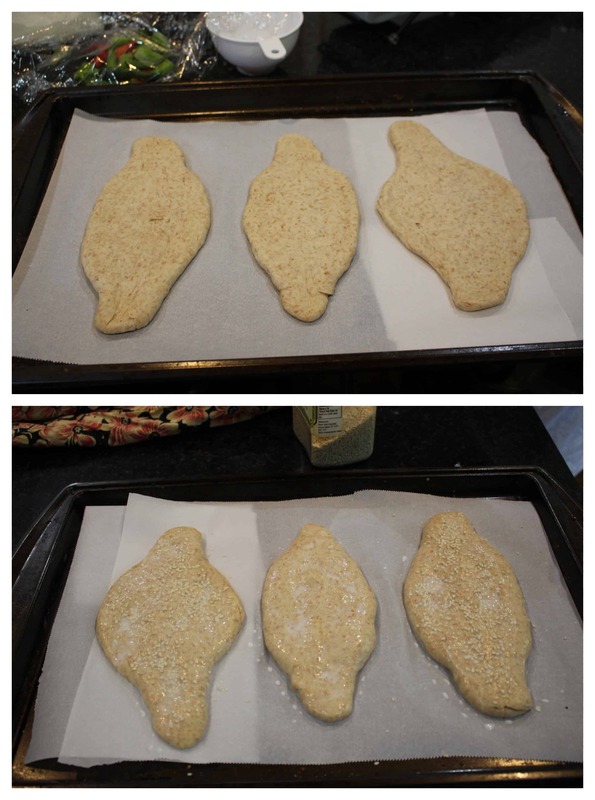 Very interesting shaped bread , Sandhya. 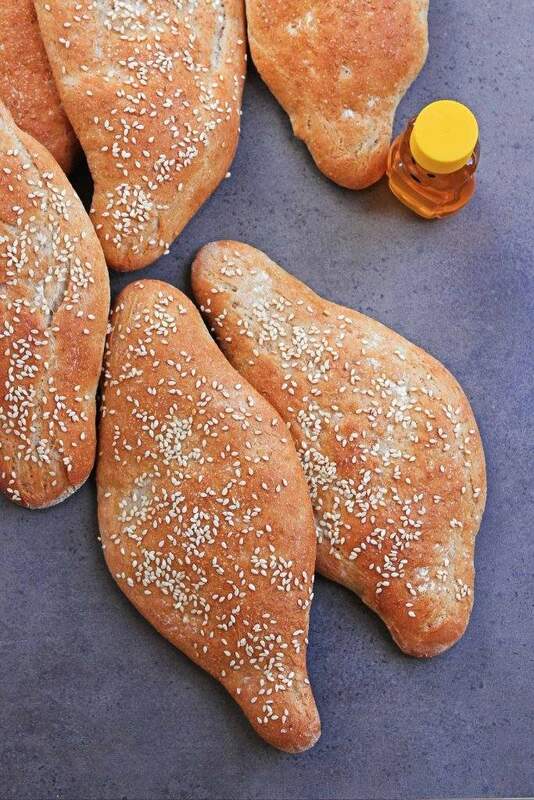 We used to buy similar shaped bread from our nearby middle eastern store. Glad that the boys loved the bread. Those samoons look so beautiful….love the shape. I too have this dish bookmarked but yet to try it! Yours has turned out fabulous! 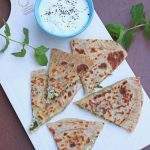 I have baked samoons for a Mega bm and we loved this iraqi flatbread as sandwiches, they have come out super pretty and beautiful rustic crust Sandhya.. Beautifully baked breads there. 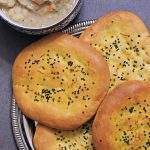 These are beautiful breads Sandhya. Nice pick for the alphabet. 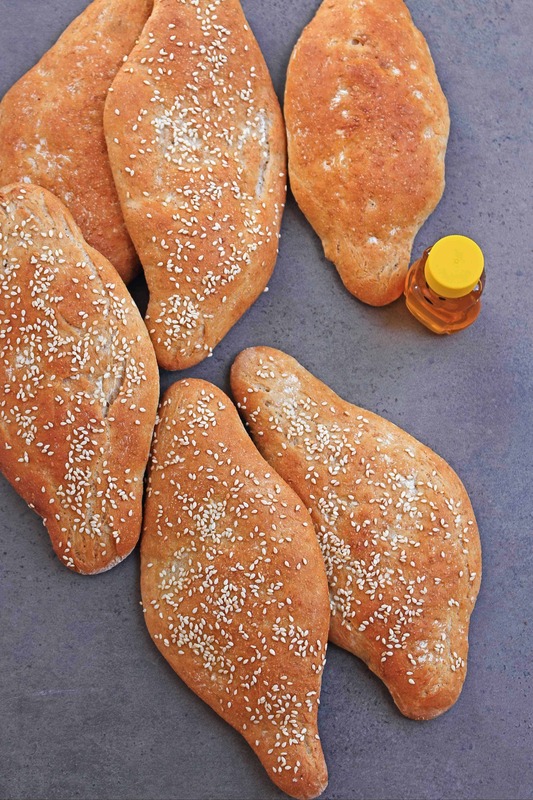 I am partial to sesame seeds studded breads, so I never miss an occasion to use them. 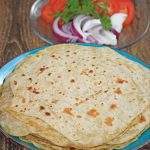 With whet bean and wheat flour, these breads are healthy too..
Samoon with wheat bran is a healthy bread , the use of wheat bran in any flatbread or bread is s great idea to make it healthy . I am a great fan of bran so use it regularly . 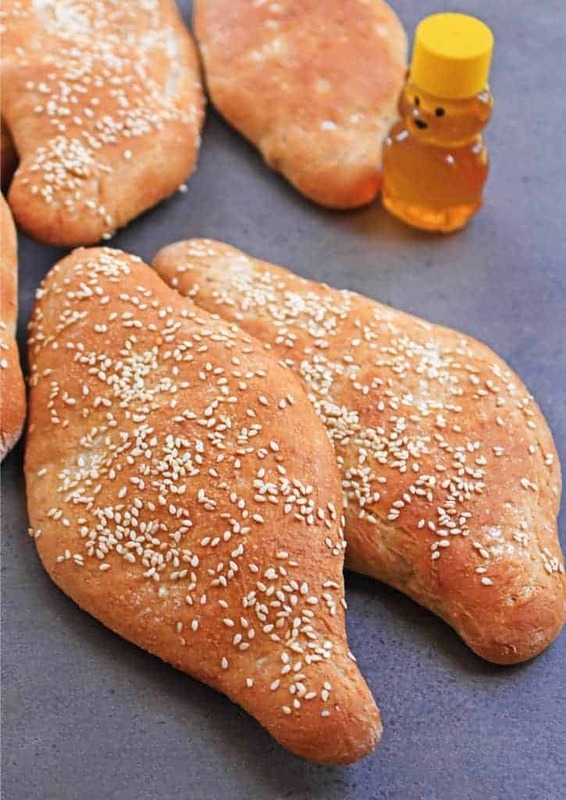 Sesame seeds make the bread look so pretty and healthy at the same time . This bread looks so tasty and flavorful… love the shape specially. 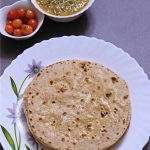 Samoon with wheat bran..makes it so rustic. Love the shape of these beautiful looking bread. 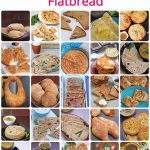 So beautifully shaped bread and good that you are able to get the boys fed with all these yummy breads. Since I haven’t been able to get wheat bran, I have given up many breads..this one is amazing..
your samoon iraqi flatbread really looking attractive. with such a shape kids automatically enjoy having without fuss. yet to try wheat bran. I will try this one. with soup usually, we eat storebought crackers. love this recipe. A very unusual but interesting shape of the bread. Wheat bran in the bread not only has made it healthier but look rustic as well. Love that diamond shaped bread Sandhya and looking at your breads, I wish I could be your neighbor!